Checking your skin regularly is the best way to pick up changes that could indicate skin cancer. How many moles do you have on your body? If you spotted a freckle on the back of your arm, would you know if it had always been there, or had changed shape or colour? What about one in your hair? Without checking your skin regularly, it can be hard to notice changes that might indicate skin cancer. And when it comes to skin cancer, there are a few good reasons for Queenslanders to stay vigilant. Year-round high UV levels and a warm climate that entices us to spend time in the great outdoors mean that the Queensland lifestyle can lend itself to high levels of sun exposure. It’s no surprise then that Queensland has the highest rate of skin cancer diagnosis in the world. Skin cancer can be deadly, but is often curable if found early. It’s important to check your skin regularly for signs of skin cancer. Cancer is the name given to diseases that cause cells in a specific part of the body to grow and multiply rapidly. 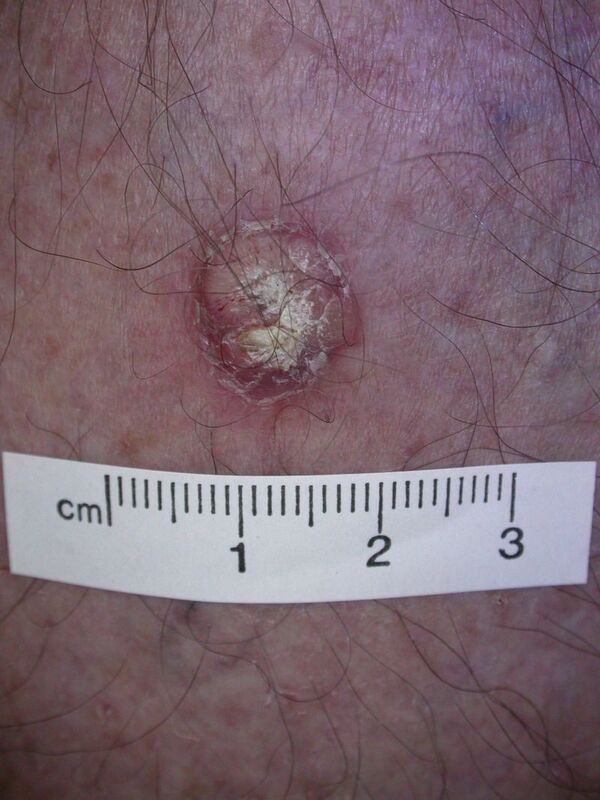 Skin cancer is cancer that develops in the skin cells. There are different types of skin cancer. Basal cell carcinoma is the most common type of skin cancer. This type of skin cancer can appear as a lump or scaling area of skin, which is red, pale or pearly in colour. The spot may become ulcerated (a sore) and not heal. Basal cell carcinomas often grow on the head, neck or upper body. They tend to grow slowly, without spreading to other parts of the body. 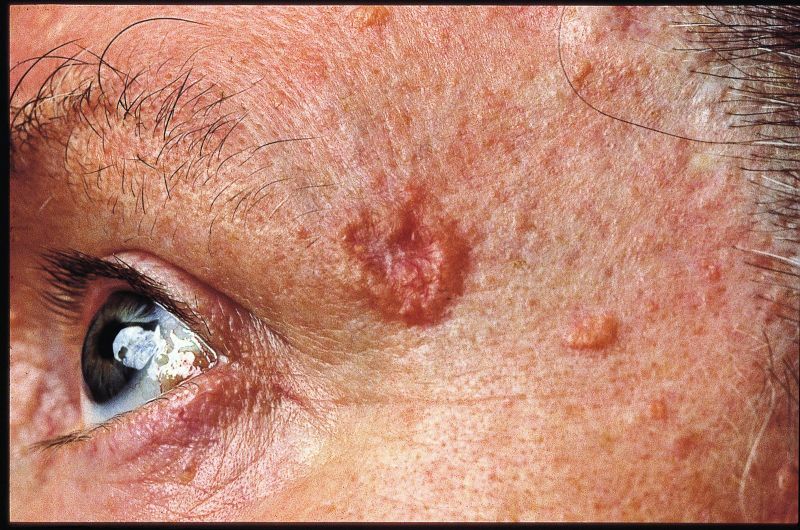 Squamous cell carcinomas appear as a thickened, red, scaly spot. These spots might bleed easily or ulcerate. They appear in places that are most often exposed to the sun. Squamous cell carcinomas grow slowly over months and can spread to other parts of the body if left untreated. Melanoma is the most dangerous skin cancer. If not treated, it can spread to other parts of the body, often including the lymph nodes, liver, lungs, bones or brain, and can be deadly. 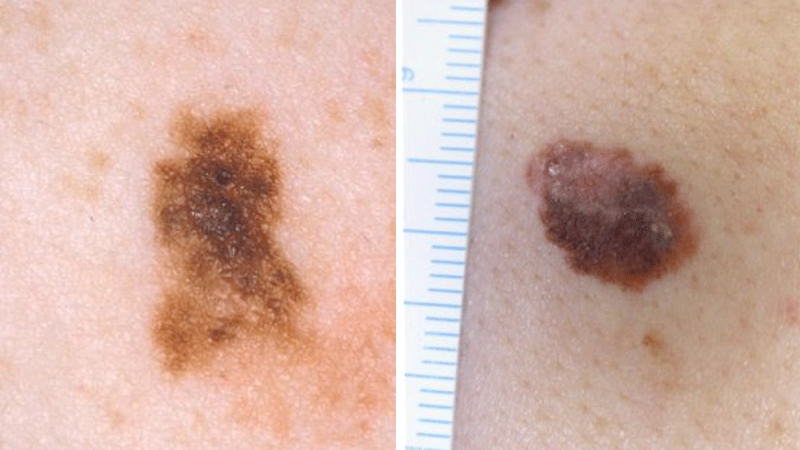 Melanoma might appear as a new spot, or they might grow in an existing spot, freckle or mole. They can be flat on the skin or stick out. 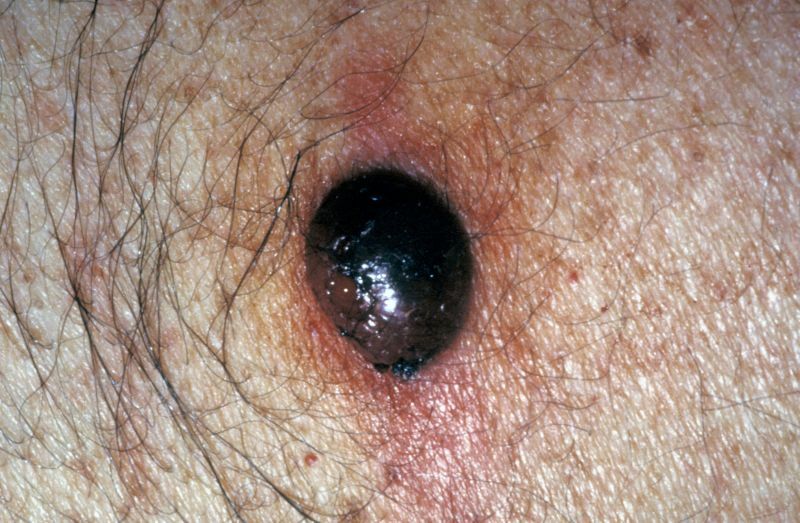 A melanoma will often have an irregular outline and be more than one colour. You can see more pictures of the different types of skin cancer here. If you notice a change in your skin that doesn’t look like one of these pictures, you should still have your doctor take a look just in case. or spots or freckles that look different from others on your skin. Remember to check your body. You might need to have someone help you check hard-to-see areas. and your legs and feet – including the soles of your feet, between your toes and in your nail beds. You can take photos of your moles to help you track any changes. Apps like Miiskin can help you track your moles over time. What should I do if I notice a change or new spot? Show your GP the area you are concerned about, so they can have a look at it. Your doctor might look at the spot with special equipment, take a biopsy or refer you to a specialist skin doctor for further investigation or treatment. When should I start checking for skin cancer? Skin cancer is not just a disease that impacts older people. In fact, melanoma is the most common cancer in young Australians aged 15-39, and it kills more Australians aged 20-39 than any other single cancer. Checking your skin from a young age will help you notice changes as they happen, rather than questioning if that mole on your knee is new, or if it’s been there you’re whole life. If you’re over 40, you can now use a tool created by the QIMR Berghofer Medical Research Institute to predict your risk of melanoma. My skin doesn’t burn, do I have to check? Most skin cancers are caused by damage to the skin cells from ultraviolet radiation exposure from the sun, but some skin cancers develop without sun exposure. Even if you’ve always been careful in the sun, or you have very dark skin that doesn’t burn, you should still check your skin for changes regularly. Should a professional be checking my skin? Cancer Council Australia recommends getting familiar with your skin as the best step to noticing changes possibly linked to skin cancer. Your GP or a specialist doctor can check your skin for you as well, but remember that you are the person who will see your skin every day. Taking responsibility for knowing your skin could be potentially lifesaving. If you are at very high risk of skin cancer your doctor might recommend that you book a check with them more frequently. People at high risk have very fair or fair skin, red or blond hair, have had a previous melanoma or other type of skin cancer or a strong family history of melanoma. The majority of skin cancers are caused by sun exposure, and are preventable by minimising your skin’s exposure to the sun. Follow the five ways to be sun safe to protect your skin from sun damage. Some skin cancers aren’t caused by sun exposure. This is why you should check your skin regularly, even if you’ve been very vigilant about sun, including places that aren’t exposed to the sun.